When we think about heavy duty shoes, the shoes that generally comes to mind are steel toe boots. These shoes have reinforced toes to shield the feet from hazardous flying and falling objects. 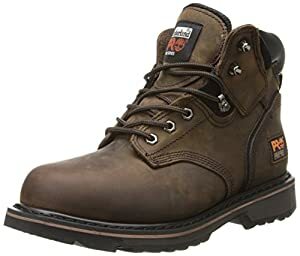 With many brands available in the market now, it could be a bit difficult to choose the best steel toe boots that will fit your needs. If you have no idea how to choose the right steel toe boots for you, then you’re lucky because we’ll be giving you buyer’s guidelines. To make your selection easy, we’ll review some popular brands for both men and women. All brands are reviewed according to the criteria of durability, safety, fit, and comfort. One of the most common errors in buying steel toe boots is choosing an ill-fitting one, which may be too short for your actual foot size. Though steel toes offer protection, they could be hard on your toes. Just imagine having that steel material rubbing your toes all day long. What you should do is look for a pair of boots that provides sufficient space so you don’t hurt your toes with the steel. This may mean trying a size slightly bigger than usual. Another factor to look for is the proper width. Fit is extremely important in a work boot. Comfort is quite subjective. Everyone has his/her own opinion about comfort, but generally, the most comfortable steel toe boots should be lightweight and flexible. However, steel toe boots tend to be heavy because they’re usually made from heavy-duty material to shield your feet from falling objects. To protect your feet from the discomfort of the steel cap, look for a soft interior fabric and softened insoles. The sole should be flexible enough to avoid restricting your feet movement. If you like to stay comfortable even in the rain, look for a water-resistant feature. On top of protection against crushing objects, steel toe boots should also offer some great safety features, like shock absorbing technology and shafts for ankle support. A shock absorbing technology can reduce the impact that can wear away your knee joints as your foot hits the ground. The shafts should stay firm even when you bend forward to support your ankles. To be safe from slippery floors, look for rubber outsoles and a non-skid traction label. With recent technology, some models of steel toe boots even go as far as offering electric hazard protection. If you like your steel toe boots to last as long as possible, invest in a 100% leather. Not only does it offer a good water resistant feature but it is also a breathable material that provides your feet additional comfort and resistance to fungus. A durable rubber sole can also go a long way in terms of comfort and flexibility.